Kenny Dalglish, Coach of Liverpool, turned 60 on Friday March 4, 2011, but he couldn't unwrap the gift he most wanted until Sunday when his team beat Manchester United, 3-1, at Anfield. It was a hat trick from Dirk Kuyt that gave Liverpool the win, with United's only goal coming in stoppage time from Javier "Chicharito" Hernandez. 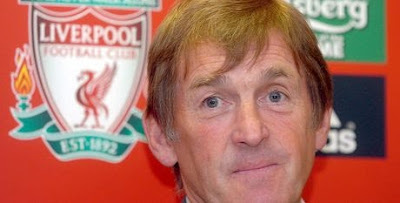 When the new American owners of Liverpool replaced Roy Hodgson with Kenneth Dalglish this past January, the move was well received by the Liverpool fans who had been clamoring for the return of King Kenny, but many observers wondered if Dalglish's long absence from the coaching ranks of top flight English football would be a hurdle preventing any real progress by Liverpool either on the pitch or on the table. Dalglish made his return to the Liverpool sideline on January 9th, when the team lost 1-0 to Manchester United in the FA Cup. Dalglish's first Premiere League match was against Blackpool, which Liverpool lost 3-1. The new Dalglish Era at Liverpool was off to a rocky start, but things turned around, and coming into today's match with Manchester United, Liverpool, under Dalglish's coaching, has picked up 14 points in the Premier League, only losing one more match, which was to Wigan last week. Now that the squad and the Dalglish transfers, Andy Carroll and Luis Suárez, had several matches under their collective belt, Sunday's match with Manchester United would be a good a moment to measure how far the new Liverpool had come since their FA loss to Sir Alex Ferguson's side back in January. The match started a bit slow, but Liverpool, led by Suárez, Raul Meireles, and Dirk Kuyt, went on to dominate the match, showing that Dalglish still has what it takes to coach in the EPL. At one point during the match, the Liverpool fans serenaded Dalglish with a round of "Happy Birthday:"
Despite Sunday's resounding victory over Manchester United, Liverpool has no real hope of winning the league; however, this victory is a sign that Liverpool is on the right track and will likely find themselves back in Europe next season. Meanwhile, United's loss has loosened its hold on the top of the table giving Arsenal an opening to challenge the Red Devils for the title.